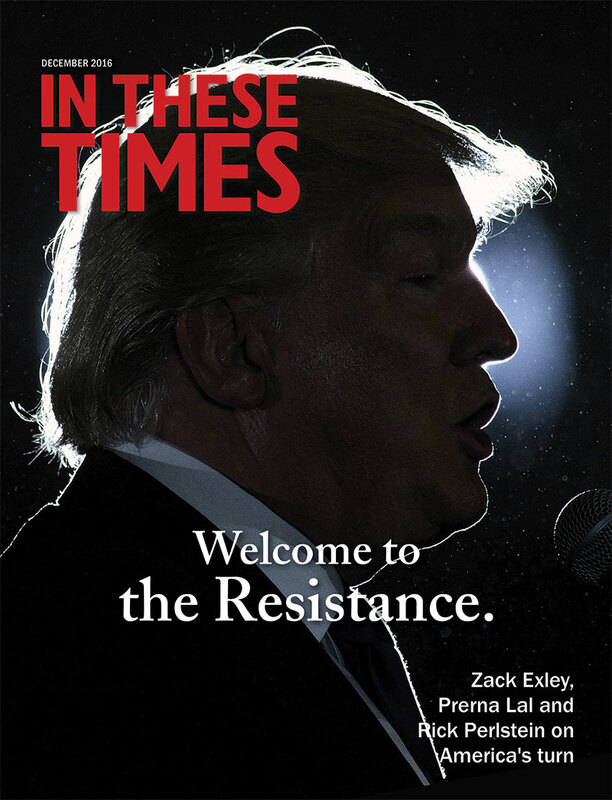 In These Times, an independent, nonprofit magazine, is dedicated to advancing democracy and economic justice, informing movements for a more humane world, and providing an accessible forum for debate about the policies that shape our future. In 1976, author and historian James Weinstein founded In These Times with the mission to "identify and clarify the struggles against corporate power now multiplying in American society." Weinstein (1926-2005) was joined in establishing this independent magazine of news, culture and opinion by noted intellectuals Daniel Ellsberg, E.P. Thompson, Noam Chomsky, Barbara Ehrenreich, Julian Bond and Herbert Marcuse, all of whom were among the original sponsors of the magazine (see full list of founding sponsors below). Thirty-four years later, those sponsors now number in the thousands--as a not-for-profit publication, In These Times, like all political magazines on both the left and the right, has survived with the help of readers who make donations above and beyond the cost of their subscriptions. Three decades after its founding, In These Times remains committed to covering the controversial issues of our time. Through five presidential administrations, In These Times has adhered to the belief that to thrive, a progressive political movement needs its own media to inform, educate and orient itself. A strong democracy depends on healthy debate, and In These Times is one of only a handful of independent media projects fighting to widen the terms of national discussion. In These Times has frequently scooped the mainstream media on stories ranging from the first coverage of global warming and extensive investigative reporting on the Iran Contra scandal in the '80s to early in-depth coverage of the genocide in the Sudan in 2004. Such reporting has earned In These Times more Project Censored awards than any other magazine. A dedication to independent journalism based on progressive values is one of the primary characteristics separating In These Times from the conventional, corporate and increasingly embedded media. Over the last 28 years, In These Times has distinguished itself by producing high-quality journalism that treats women, communities of color, working people and other groups ignored by the mainstream media as legitimate audiences, sources and subjects for the news. The late Sen. Paul Wellstone, one of the first subscribers to In These Times, put it this way: "Meaningful democracy cannot survive without the free flow of information, even (or especially) when that information threatens the privileged and the powerful. At a time of growing media concentration, In These Times is an invaluable source of news and information that the corporate media would too often prefer to ignore." Robert Allen, Julian Bond, Noam Chomsky, Barry Commoner, Al Curtis, Hugh DeLacy (1910-1986), G. William Domhoff, Douglas Dowd, David Du Bois, Barbara Ehrenreich, Daniel Ellsberg, Frances Putnam Fritchman, Stephen Fritchman, Barbara Garson, Eugene D. Genovese, Emily Gibson, Michael Harrington (1928-1989), Dorothy Healey (1914-2006), David Horowitz, Paul Jacobs (1918-1978), Arthur Kinoy, Ann J. Lane, Elinor Langer, Jesse Lemisch, Salvador Luria (1912-1991), Staughton Lynd, Harry Magdoff (1913-2006), Herbert Marcuse (1898-1979), Carey McWilliams (1905-1980), David Montgomery, Carlos Munoz, Harvey O'Connor (1897-1987), Jessie Lloyd O'Connor (1904-1988), Earl Ofari, Ronald Radosh, Paul Schrade, Derek Shearer, Stan Steiner (1925-1987), Warren Susman (1927-1985), Paul Sweezy (1910-2004), E.P. Thompson (1924-1993), Naomi Weisstein, William A. Williams (1921-1990), John Womack Jr.